PAR-Scan® is not just an ordinary packaging machine for your parquet. PAR-Scan® measures the length of each board in a pack, number of m², number of boards in the pack, pack after pack. The measuring data, plus the width, thickness, wood type, quality, surface area, etc. are printed on a label. The label is available in different languages; British units are also possible and a logo or barcode can be added. The information of each package is saved, a pallet list is printed out and all data are digitally available for your administration. Measuring, registering, labeling and packaging without manual intervention! Costly measuring, writing and calculation errors are excluded. 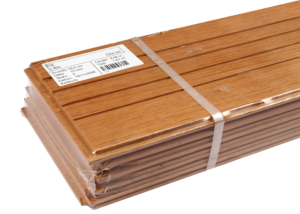 Parquet with fixed or variable lengths in one packaging. Maximum of 10 layers per pack and 3 floor boards per layer. Every square meter produced is measured and registered. PAR-Scan® can be supplemented with PAR-Stock® for stock control management and order picking. The combination PAR-Scan® with PAR-Info® ensures automatic addition of a leaflet to each package. On this leaflet the manufacturer can add all kind of useful information for the customer e.g. about storage and maintenance instructions, instructions for installation, warranty conditions, CE symbol, product specifications, a logo or brand name.